Biking on the rugged terrains of Ladakh is surely every biker’s dream. In order to feel the thrill and make this dream come true, planning an adventure trip to Ladakh is obvious. Choose from a wide range of Ladakh bike tour packages and get ready to pacify your adrenalin rush. Set about for an ultimate biking expedition with Ladakh motorcycle tour. 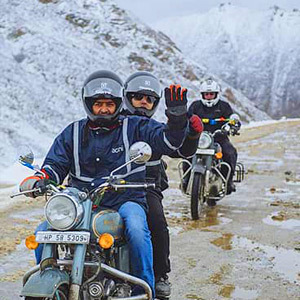 Ride on the highest motorable roads in the world. Cross some of the highest passes and take up the challenge to pass by the hairpin bends. Your Ladakh bike tour itinerary will offer you everything that you can envisage for memorable holidays. Show your love towards your bike and present your biking skills as you commence Manali to Leh Ladakh bike trip. Whether traveling solo or with your friends, the enthralling voyage will surely evoke the wanderlust in you. Embark on a Ladakh bike trip and you are sure to return with a bag full of memories and ultimately a new you! Stunning vistas of Leh Ladakh await to cast a spell on you. Furthermore, defy the laws of gravity at Magnetic Hill. Soak in the ethereal charm of the mighty Himalayas as the sun slowly appears from behind the snow-laden peaks. All this and much more is only possible when you brace yourself for Ladakh bike tour.